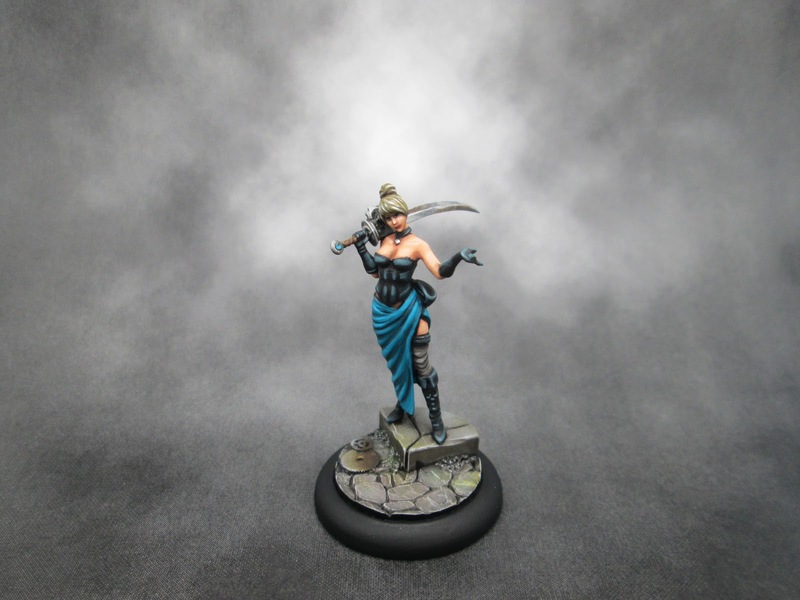 This week I painted up Cassandra for my (future) Colette Malifaux crew. This model is from the Smoke And Mirrors plastic Malifaux box set. I painted this model for a painting contest at Mengel Miniatures for the individual figure category. This model was challenging to paint and I tried some new techniques. Read on for some more pictures of Cass. 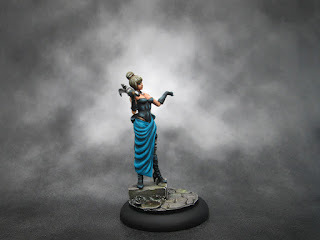 This model will be the henchwoman for my Colette crew when I paint the rest of the box. Cassandra is really fast and lethal in melee in games. I used her in two games on Vassal. In one game she killed Kill Joy in one activation. This model was tricky to assemble. The pieces fit together well but there was a big seam down the model's right side of the dress. I used plastic glue to weld the seam three times and then painstakingly cleaned the seam with an exacto knife. Luckily the joint is not visible now on the final model. I'd gladly trade less undercut for a one piece dress. The lower dress itself was three individual pieces plus a leg. I really pushed myself to try some new things on this model. I've been wanting to try painting sheer stockings for a while. I mixed in some flesh as I highlighted it to try and create the illusion of a partially sheer stocking. I've been painting True Metallic Metals on the metal parts of my Arcanist models. Basically, this means creating a gradient on metal items using metal paints and some darker brown to create contrast. I really like how it has turned out on her sword on this model. It is tricky to blend metallic paints. I can see why many people prefer to paint NMM to blend with regular acrylics. I'm really pleased with the black areas of the model. I painted them black and the started the highlights with P3 Coal Black. I then mixed in some white for 2-3 more layers of highlights. It is a wonderful color to work with. Lots of depth. The dress gave me some trouble while painting it. I painted in the shadows and highlights. The first time I painted it the contrast was too high and looked stripey. I got annoyed and painted over and completely repainted it. The biggest change for me was changing how I painted female skin. Male models have the advantage of hugely over-exaggerated muscles (or so I tell myself) and very defined faces. The smoother female sculpts require a different approach. I started from a lighter basecoat. I also did larger highlights over a bigger area and did not do such a thin line on the final highlight. I'm interested to hear what people think of the skin on this model. I've got a few Doves almost finished on the painting table. Next week I will start work on the first Iron Painter entry. I'm also hoping to paint a few odds and ends for Flames of War over the next month or so. I'd love to hear what you think of this model. It was a challenge to paint and I am please it is finished now. Thanks for visiting. Yeah, the female models are really petite. I'll take some pictures with some other models when I photograph the next batch. I like her. The hair stands out most to me - very effective and realistic blonde colours. Her skin looks very nice. Smooth transitions from gentle highlights to the shades. You're right, not easy at all. Thanks Dai. I'm glad you like the hair as I was a bit unsure of it. I thought the contrast might be too high.